If you want a very cool camera drone with big features and a tiny price tag, you’ve definitely come to the right place. 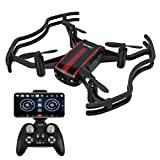 The AKASO A21 Mini Quadcopter Camera Drone is worth every penny of its $70 retail price thanks to great features like an HD camera, one-touch takeoff and landing, and an awesome choreography mode that lets you create a flight pattern even with tricks and then replay it with the touch of a button. It’s indeed well worth the $70, but use the coupon code 5FFKQXJ6 at checkout and you’ll pay just $41.99! OPTICAL ALTITUDE HOLD & EASY CONTROL: Optical flow position hold automatically maintains the drone’s hover position without need of input from the pilot. Which makes it easy to control the drone. It is a good assistance for kids and novices to taking photo.